Now that Kevin Dillon's time in Boston has all but run its course, he has decided to do the same. The Donegal native whose three-year visa expires at the end of April has planned a dramatic farewell to the city he would love to call home: running the Boston Marathon. "As much as I'd love to stay, I knew the terms of the visa when I applied," said Dillon, 26, sipping a post-run ice water at a table in the Green Briar pub. "What I didn't expect, though, was finding in Boston a home away from home. You invest so much of your life here. You grow roots here. It's hard to just close that door and say goodbye." One of 10 children, Dillon grew up in Letterkenny, not far from the border of Northern Ireland, where as a child he would hear stories about the United States from local athletes who had crossed the Atlantic for a summer of Gaelic football. A desire to see "a bit of the world" took Dillon to Australia and Spain before his successful application for a Walsh Visa, a program sponsored by US Representative James T. Walsh of New York to provide young men and woman in Northern Ireland and the counties bordering it with a work and cultural opportunity in the United States. Dillon's initial job in a Boston hotel reminded him too much of the monotonous work he had hoped to put behind him. Within weeks he found greener pastures a few blocks away at Marathon Sports' Boylston Street location. That the shop's address marks the finish line of the Boston Marathon will make for a poignant last mile. "I've walked down that street so many times," said Dillon. "I can't wait to run by the store, blow a kiss, and say goodbye." His smile dims a moment, before returning in full. "My girlfriend doubts that I'll be able to lift my arms to blow a kiss," he said. "She might be right." Marathon Sports manager Robert Kirsch remembers Dillon's arrival. "We had no idea what to expect when the Irish embassy called looking to place him," said Kirsch. "Within moments of meeting him, I knew we had the luck of the Irish. Here was someone with a gift for putting people around him at ease. I've seen it again and again with customers and employees, even with the people Kevin bumps into on the street. He leaves people smiling." Then there's that touch of Erin in Dillon's voice. "He had the women swooning," Kirsch said, "and we had a store full of young men trying to imitate that brogue." More footballer than runner, Dillon originally laughed at the prospect of covering 26 miles on something other than a soccer pitch. "These runners who came in the store seemed mad," he said, adjusting the brim of his rain-slicked Adidas cap. "I didn't understand their obsession with the marathon. I'm beginning to get it now, though. I haven't even run my first one, and already I'm thinking about and planning my second." 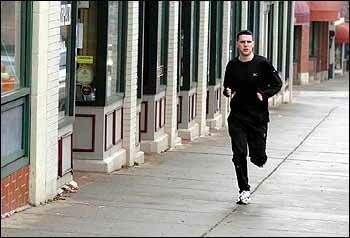 Dillon admits to entertaining myriad scenarios for a return to Boston during his daily practice runs of 5 to 10 miles. He imagines running the Chicago marathon at a clip that would qualify him for a number in next year's Boston Marathon. He imagines the long shot: the Green Card lottery plucking his card this spring. Though he values New England's distinct seasons, his gratifying work, and the European feel of this city, Dillon explains his desire to remain here in terms of people, not place. "No one individual thing has made me feel at home here," he said, removing his cap to reveal a tight crew cut. "It's individual people that have made me feel so settled." Two of them will hit the road with Dillon on Patriots Day: his girlfriend and his sister Rosaleen. He feels sharply the impending loss of time spent with his older sibling. "It'll be strange not to have Rosaleen nearby," said Dillon. "We've grown really close these past few years, closer than we ever did growing up together back home. We talk almost every day. I don't like the thought of seeing her only on holidays. We're best buddies now, you know." His sister, surprised as he, agrees. "I'm number five and he's number seven," she said. "The few years between us that got in the way as kids no longer seem a big deal. Having family here, a connection to home in this new home, that's what matters." Putting aside any past sibling rivalries, the Dillons will compete against themselves, not each other, on Marathon Day, said Rosaleen who calls her brother, "the greyhound." She credits Kevin with inspiring her run, but blames him for putting a damper on this St. Patrick's Day. "We can't celebrate the way we want to, not when you have to get up for a 20-mile run the next day, she said. "St. Pat's will be quiet, like the ones we knew back home." They have plans to raise a few pints at the 27th mile, though. "There'll be some celebrating that night," Kevin said, "and some commiseration. You know, the whole high and low thing. It's very Irish." Dillon, like his sister, welcomes the training that has displaced the thoughts of imminent departure. His one regret, he says, is not attending college. "After I finished high school, I wasn't sure what I wanted to do," Dillon said. "I traveled and I worked, worked and traveled. But without that third-level education, I can't get the J-1 (student) Visa I'd need to stay here now. So, I might go back to school in Ireland or maybe apply to colleges here." Dillon pushes the empty pint glass to the center of the table and taps its rim with his gold ring. "This belonged to my father," he said, rotating the monogrammed ring. "He and my mom are coming over for the marathon. They'll be at the finish line when me and Rosaleen cross it. It will feel a bit like home, you know." Ron Fletcher can be reached at fletcher@globe.com.